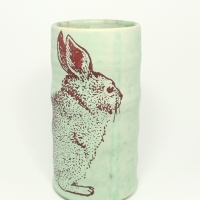 SC&A’s stoneware bowl is glazed with a glossy food safe glaze with a rabbit image. this bowl was handmade on the potter’s wheel. a good size for earrings, rings and keys. 4 inches in diameter, 1.5 inches tall. all items made by Stanley Chester & Albert are made of high fired stoneware, and are food safe, dishwasher safe and microwave safe. Stanley Chester & Albert "Octopus Bowl"
Stanley Chester & Albert "Skeleton Hand Bowl"
Stanley Chester and Albert "Rabbit Vase"